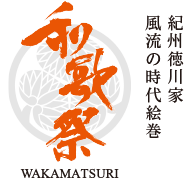 Wakamatsuri Festival is the name of the parade in which the portable shrines are carried around during the grand festival of the Kishu Toshogu Shrine, held on the second Sunday in May every year. Known for other names such as Kishu no Kuni Matsuri (festival of the Kishu province), Tenka Matsuri (literally “festival of the reign”), and Gongen matsuri (“festival of incarnation”), this parade has been loved by the people. 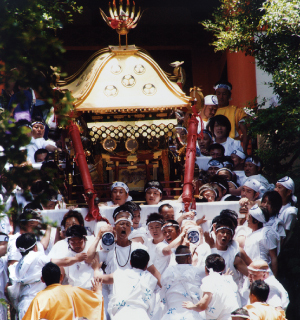 There are a few views on how the festival got its name, such as coming from the name of the mountain at Toshogu, the Wakasan mountain and the effort put in by the people of the area to hold the festival, or after the practice of referring the Toshogu as Waka no Omiya (“the shrine of Waka”) as people believed the name of Toshogu was too sacred to say during the Edo period. 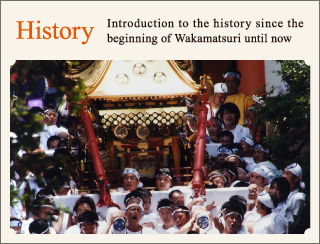 The Wakamatsuri started in 1622, during the 8th year of the Genna during the Edo period. 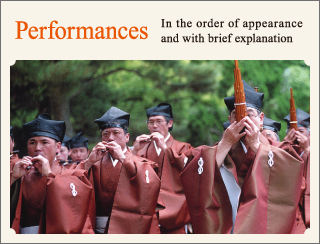 Possibly because it started shortly after the period of warring states had ended, there are parts of the parade which resemble the period and are different from other festivals. 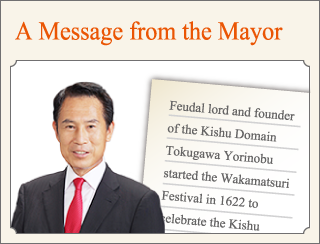 The people of Kishu have taken great pride in and passed on this festival on to others – a festival like no other. This festival also presents the pride which the people of Wakayama take to preserve and to pass on this traditional festival to future generations. On the day of the festival, the parade demonstrated the bravery of Kishu and the spirit of the people of Kishu on land, and on water, osekifune (sea vessels) were seen. The festival took place on both land and water. It was once known as one of the Three Great Festivals of Japan and the Grand Festival of Kishu province. Currently the sea vessels are not used and only the divine palanquin parade on land remains. When the festival started, it was centered around the Kishu Tokugawa clan and all performances of the parade consisted of kabu organizations. The performances were prepared by those organizations independently. Those collected kabu in combination formed the parade, and the local people followed and performed their acts as on that day normal formalities and rules do not apply. The kabu and the skills have been passed on to the next generations with pride by word of mouth through groups of retainers. Now, there are kabu which are about to fade away and be lost as the world changes and we move away from the era of the warriors. Another reason causing this is the diversity of the people which the tradition is being passed on to. 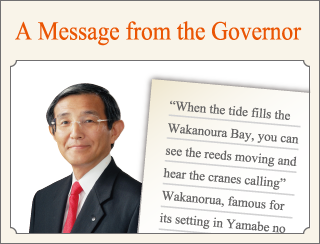 However, we cannot overlook the fact that with the support of the thoughtful people and those supporting the local economy, there is a movement to bring this ritual back to its original state as one of Wakayama Prefecture’s biggest events of the year which we cannot afford to lose. We have high expectations of those who will bear Kishu’s next generation to succeed this traditional ceremony which our parents and ancestors have left for us.